I was young. I was shy. I had eyes that were never dry. A vacancy that I could not avoid. Because I am complete, so I rise. Everyone was silent after she finished, including me. Gwendolyn’s reading of her life served as an invitation for others to share, as well as to relive moments in their lives. The instructor for Yoga, Literature and Art Camp for Teen Girls (YLA) on this day was Maya, a full-time yoga teacher who had taught middle school for ten years before deciding to leave the field at the end of the previous school year. Maya was the first teacher I recruited to teach the girls at YLA camp. 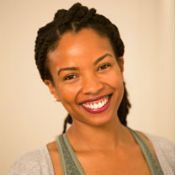 Maya and I have had countless conversations around our experiences as Black women within yoga communities and our experiences as Black teachers serving Black and Brown children in predominantly white schools. As soon as Maya learned about the camp, she was on board and ready to participate in any way she could. Prior to the start of the camp, Maya voluntarily created a snack menu for participants and donated the majority of the fresh fruit and water. Teaching was second nature to her. Before camp began, I wondered what types of stories we would create with the girls, and how much they would inform both our teaching and our yoga practices. Gwendolyn’s reading of her life served as an invitation for others to share, as well as to relive moments in their lives. Because of Maya’s experience with middle school youth, I consulted her regarding ways in which we could further literacy in YLA camp. Initially, our plan was to have the girls read a novel, and then for the yoga instructors to integrate themes from the book into their yoga classes. However, Maya and I decided to focus on poems authored by Women of Color since we only had eight days and multiple teachers working with the girls. This would allow each yoga instructor the opportunity to select poems to accompany their class. “To progress!” two other girls exclaimed simultaneously. “So that’s just to get your thinking minds, your intellectual minds, thinking about what it means to rise. “We are human beings. We can fall down and we can rise again and again. So this practice is going to be focused on movement upward. So, in the spirit of moving upward, go ahead and find an 'easy seat'—whatever feels good. And if you have a cushion you might want to sit on the edge of the cushion. And let’s roll down. Let’s slump and close our eyes in this slump. Just notice how the base of the spine feels all the way up to the center of your heart. How does your heart feel when you are folded over? Can you even breathe deeply? And then with your eyes closed, begin to feel what you feel in your physical body while you are in this shape. Go ahead and walk your hands back and start to rise up. Then, bring your hands to your knees. I call this the Frankenstein stance. Keep squeezing and now bring your shoulders back and around and feel your heart open up. Begin thinking about the center of your chest. Inhale and then rise up even more. Now soften into this rising. “So y’all don’t have to be rigid. Notice the difference in the space around your heart when you’re rising up versus falling down. Just notice if it feels any different. And then draw your hands into this arisen heart. Then lift your heart to your head, and then we let the head bow down just a little bit. Then I like to take a deep breath in through the nose. You can’t be shy about this. Exhale through your mouth, hands to your heart. Together like a chorus, the girls bring their hands to their hearts and say in unison, “I rise.” I observe that some of the girls are uncertain when to say the words, looking to one another for cues. Maya takes notice too, and everyone giggles in response to the uncertainty. Together like a chorus, the girls bring their hands to their hearts and say in unison, "I rise." For the next 90 minutes, Maya guided the girls through a yoga practice anchored in Maya Angelou’s poem “Still I Rise.” Integrating yoga postures that embody the upward movement of rising, Maya engaged the personal experiences and feelings of the girls in ways that transcended both time and space. This experiential literacy community valued the roles of both the mind and body throughout the learning process. The girls opened to the teaching in a way that was being articulated through their bodies, words, and the action of remembering lived experiences. “I feel like Buddha,” giggled Lauryn. Sitting gracefully with her legs crossed in a meditative position, Lauryn’s eyes were closed as her thumbs and index fingers touched lightly. Lauryn was the tallest of the girls, but not the oldest. Starting a new school in the fall as a ninth grader, Lauryn expressed her anxiety about this transition more than once during the camp. She also shared her uncertainty about coming to YLA camp without knowing anyone there.